Before we bid adieu to 2011, let’s take a look at the most popular posts in The Savvy Freelancer for 2011. This list is based on the number of page views, as well as the number of comments on each post. I didn’t use any scientific formula, so you’ll just have to take my word for it. If you’re a freelancer, it’s easy to get freelancing advice. You can invest in books, coaching programs, and bootcamps for freelancers. Even if you’re bootstrapping, you won’t run out of freelancing advice from blogs, free webinars (ahem), not to mention well-meaning friends and relatives. The bottom line is, you can find a lot of guidance for freelancing out there. What’s critical is your ability to sift through all the information that is available, and make a judgement call on which advice is good, and which is bad. In this post, I’m sharing the best and worst freelancing advice I’ve ever seen, read, or heard in 2011. Don’t worry, I won’t name names. And if you happen to be following the bad advice I do single out here, I hope by the end of this post, you’ll be convinced to change your ways. Prepare a custom elevator speech before a live event. I got this advice from Thursday Bram, who wrote a guest post in The Savvy Freelancer about finding clients in conferences. Her pre-game advice was to create an elevator speech especially tailored to the typical attendees of the conference. By now, if you’ve been paying attention, you already have an elevator speech for your freelancing business. But did you know you can and should tweak it, depending on whom you are talking to? I made the mistake of using my generic elevator speech in one networking event, for example, and ended up being confused for a web designer. I’ve learned my lesson. I now have a custom-made elevator speech for that particular audience. I’m sure nobody will end up thinking of me as a web designer at our next event. Add a QR code in your email signature line. A freelancer wrote in a blog that this was a great idea. Um, no, it is NOT. Think about it. To be reading your email, a person is either already in front of a computer or a mobile device. If the reader is already on the computer, wouldn’t it be much easier for them to simply click on a hyperlink in your email? Than have to scan your code to get to the linked page? And if they were on a mobile device, such as a smart phone, how would they be able to scan your code? There’s a time and place for QR codes. Use them on physical objects, such as your business card, to make it easier for people to get to your landing page. If you want to learn more about using QR codes — properly — this article can help you get started. 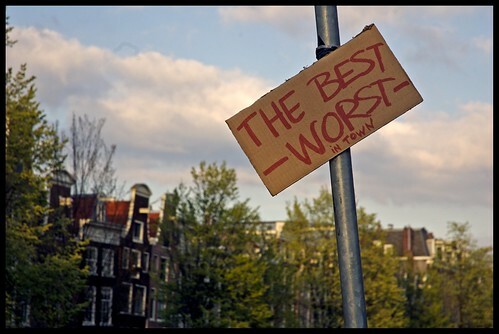 What’s the best and worst freelancing advice you heard in 2011? Share them in the comments below, and let’s get a good discussion going. Freelancers: What’s On Your Christmas Wish List? I’m writing a holiday piece for Freelance Folder and I need your help. All I ask is that you tell me what’s on your wish list this coming holidays — something(s) you want that you think will really help you succeed as a freelancer. To get things started, I’m sharing my own wish list below. LinkedIn and Lovin’ It is the latest offering of Rockable Press, an online publisher dedicated to freelancers. In fact, LinkedIn and Lovin’ It * is the only LinkedIn resource I know of that’s written specifically for freelancers. This post has my thoughts on this 80-page ebook. I want to set up a passive income website. Where should I buy the domain name? Must I host this myself or can I have it hosted elsewhere? Which is best and what are the costs associated with each? How do I know if my rate is high enough or too low? How do I know if I’m charging my clients right? Should I charge less for subjects I’m less familiar with? What is the best way to brand my new freelancing business? How can I increase my rates without losing my current clients and still get new clients? Poll: What’s the Best Freelancing Advice You’ve Ever Received? As a freelancer, you’ve no doubt gotten plenty of advice — both solicited and not — about freelancing. But others change your life. They’re gems you play over and over inside your head, to guide you like an invisible angel. I recently received a review copy of “The Winning Proposal” from its author, Juliet Du Preez, and finally made time to read it so I can give you a review. The first thing that struck me about “The Winning Proposal” was the sheer volume of it. For an ebook about writing proposals, I didn’t expect 106 pages. But there’s good reason for that.